Lore Lindu is not only on the map of the important bird areas (IBAs) of the birders, but of the neglected tropical diseases (NTDs) as well. Schistosomiasis is widespread in Africa, Asia, and South America, but in Indonesia it is only restricted to Lore Lindu, Central Sulawesi. As a medical researcher, this phenomenon is very interesting to me; schistosomiasis must have come from Asia because it is prevalent widely in China, Japan (eradicated in 1976), Thailand, and Philippines, but how it ended up in Lore Lindu without leaving trace in the area between Philippines and Lore Lindu is a mystery. As a public health professional, however, schistosomiasis concerns me: it has never been fully under control. Environmental changes linked to deforestation, water resource development, population movements and population growth have led to the spread of the disease to previously low or non-endemic areas. Lore Lindu is the example of this spread. Diagnosed in Lindu Valley in 1937, then in Napu Valley—40 kilometers away but is separated by dense pristine montane forests—in 1972, schistosomiasis has currently spread to Besoa and Bada Valleys, which are connected to Napu Valley by montane forests. Schistosomiasis is second only to malaria in public health importance but included in the list of neglected tropical diseases. It is estimated that more than 200 million people worldwide are infected every year. With the rise in eco-tourism and travel “off the beaten track”, increasing numbers of tourists are contracting schistosomiasis. Mortality due to schistosomiasis is generally and comparatively low but the chronic character of the disease cause widespread human suffering. This disease remains a hurdle for economic development in large parts of the third world. In 2005, the prevalence rate of schistosomiasis was below 1% of the populations, thanks to the Asian Development Bank (ADB) for its millions-dollar Central Sulawesi Integrated Area Development and Conservation Project (CARE handled health issues, the Nature Conservancy took care of conservation problems) from 1998 to 2005. In 2010 surveys showed a resurgence of transmission with an average prevalence of infection of 9.6% among 5 villages in Napu Valley; extrapolating to other endemic areas would result in about 4,000 cases that year. With the loan from ADB, thousands of latrines were constructed, but almost all of them are not functioning anymore now. This fact shows what a lot of money can do and how challenging to sustain the project outcome and to keep the executing humanitarian and conservation organizations stay in the area when the external fund has finished–no money, no service. Although the Government has allocated adequate budget for the control programmes, poor management of the public health measures, especially snail control, causes the failure. 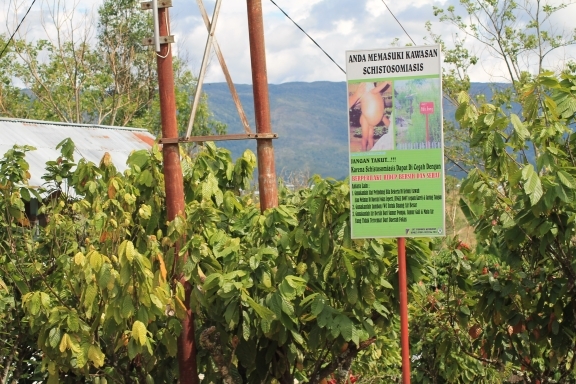 The current programs are practically sticking billboards (see photo) on the snail focuses and mass treatment only, twice a year in the areas with prevalence rate above 2%. However, it should be noted that the examination of single stool sample from each individual using Kato Katz technique underestimates the prevalence of infection by 30%. The failure of this single approach can be seen in the following table. To achieve total eradication, four-pronged approach below should be carried out in a concerted way in timing and space. Surveillance (continuous monitoring and evaluation) has to be part of the programmes. Pharmaceutical company Merck (Germany) has donated a great number of praziquantel tablets through WHO and the Carter Center since 1996. However, transmission is only marginally affected by treatment of the human host, and rapid re-infection limits the success of drug-based control due to the need for continuing treatment. More serious, however, is the fact that morbidity seems to become increasingly aggressive after treatment which requires more frequent chemotherapy to avoid making the situation worse for those treated than it might have been without any intervention at all. Although schistosomiasis does not look a major health problem in Lore Lindu, its long term impact to the affected children—anemia, stunting growth, and poor performance—must be significant, albeit difficult to measure. As our project is located in Lore Lindu, we have moral obligation to act on controlling schistosomiasis. My plan is to approach the Regency Health Office to acquire their collaboration and share mutual resources, then to raise fund for financing the efforts, and finally to execute the program as above. The result might not be spectacular, but it will be meaningful to many people, especially children.